Sat,May. 18, 11:00A Memorial for Polly B. A huge thanks to all who helped make this a sanctuary these past two weeks for women with nowhere else to go. First Sunday of Eastertide, with an Easter Cantata. 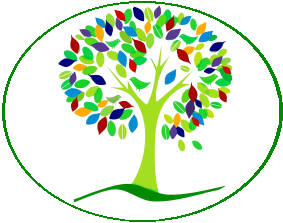 Join us as we seek to welcome all and grow together. Each of us is on a unique spiritual journey. This sixth Sunday of Lent, the Sunday before Easter, has always been a challenging one for pastors – We’re always faced with this dilemma: do you focus on the Palms, the jubilant welcoming of Jesus to Jerusalem? Or do you focus on the Passion, the turn this week takes to the tragic. Well, what if instead of picking between these two possibilities, we paused to say: This is life. Sometimes jubilant and celebratory and exciting and filled with anticipation. Sometimes sad and worrisome and perplexing and filled with dread. And sometimes, both at the same time. Someone asked me recently how I felt about my oldest heading to Cambodia for 27 months to serve with the Peace Corp, and I asked if there was a word for “proud and sorrowful and thrilled and scared.” Okay, it’s not on the scale of Palm / Passion Sunday, but still - looking at this particular Sunday in the church year, I would say, “Sixth Sunday of Lent” is one of the better descriptors of this almost untenable mix of emotions. May God bless our hearing and our understanding of these words – The first of which harken back to the announcement of Jesus’ birth – When the multitudes of heavenly host sang, “Glory to God in the highest heaven,” and “Peace on earth.” And even further, to Psalm 118, when people would say “Blessed is the one who comes in the name of the Lord” when pilgrims would enter the Temple. And now, Jesus knows, and we know, that all his followers’ expectations are about to be crushed. Because we do not recognize the things that make for peace. I have a saying that hangs on my wall at home that says, “Peace: It does not mean to be in a place where there is no noise, trouble, or hard work. It means to be in the midst of those things and still be calm in your heart.” Easy to say, hard to remember, harder to live. And this passage carries us from the jubilation of the disciples, thinking they are about to be freed from the yoke of the Roman oppression and occupation, to Jesus’ tears, because he knows they haven’t understood a thing, and hard, hard times are coming, and they aren’t ready, and he won’t be there to help them out. He’s done what he can to prepare them – Now they have to live through these days, and the days and years to follow. They are about to lose the person they thought would save them; they are about to lose themselves; and indeed, within 50 years, Rome will have won, crushing the spirit and the Temple of these people. Even Jesus has to face his own limitations: He can only tell them about peace, point it out, give it to them. But it’s up to them to hear his message, see his peace, pick it up and carry it in their hearts. Maybe, as we see the disciples filled with thanksgiving, and hope, and expectation, and celebration, then within a sentence, we hear about Jesus’ crying because human beings just don’t get it, and his time has just about run out, and we are going to suffer – He knows it’s coming – Maybe “normal” life is a profound mysterious mix of the two: joy and sorrow. It’s our impulse to want to avoid pain, and sorrow, and suffering. And for everyone who is a parent, it is an overwhelming, and I mean, overwhelming, urge to protect your kid from pain, and sorrow, and suffering. Some people think baptism will give their baby like a holy force field that will protect them. 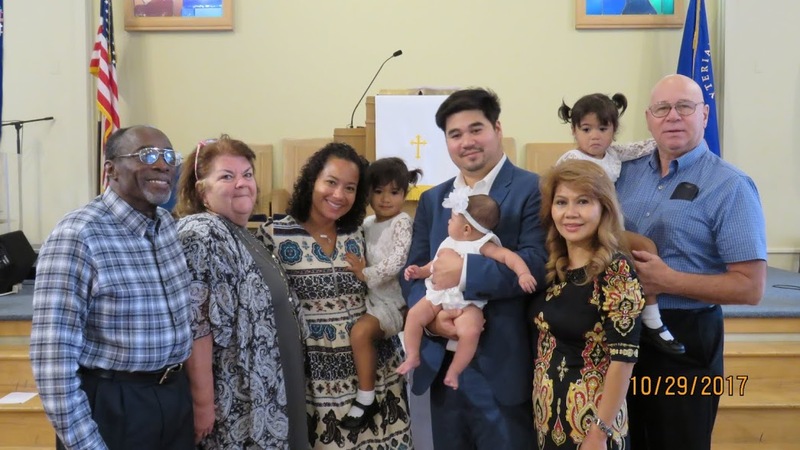 That once baptized, God will keep that baby safe. I’m pretty sure life doesn’t work that way; I’m positive God doesn’t work that way. During my sabbatical, that I spent hiking all over – I wore waterproof hiking shoes. And at a certain point, in the very very wet late summer and early fall days, I caught myself trying to avoid the mud and the puddles. I’d walk around them; I’d go off trail and stumble through prickly undergrowth; I’d look for stones to step on, branches to lean on. As though I could avoid the muck and the mud. And I started to laugh the first time I realized what I was doing – Because I had made sure to buy waterproof hiking shoes. Shoes meant to go through the muck, the mud, the puddles. They were made for this – To carry me through beautiful landscapes, quiet peaceful forests, up to glaciers and alpine lakes, and through downpours, and mud up to my ankles, and water rushing by. And that is what we’re made for as well. Baptism reminds us that God has clothed us with this human skin, given us this human heart, equipped us for this human life – And that in Jesus, God wore this human skin, and had this human heart, to beat and to break. Elaine Pagels’ most recent book weaves together her heartache and her passion for finding God in scripture. Decades ago, but as fresh as it was yesterday, her 6 year old son died of an incurable disease, and a year later, her beloved husband died in a hiking accident. And so she writes, “Why religion?” And comes to the conclusion that religion reminds us how we are connected, and how that connection keeps us upright and breathing when devastation hits. Jesus knows – devastation is about to hit, and he has done all he can for his disciples. Lori Gottlieb, a famous therapist who writes a column for The Atlantic told Terry Gross of “Fresh Air” that it’s one thing to sit in her office and give her patients ideas for parenting; it’s a completely different thing to be in the midst of an intense parenting issue with her own 13 year old. It’s not enough to know something; some things, we just have to live through. 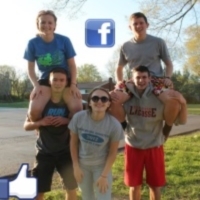 And some of the things we live through are really really rough. Places where there is no peace anywhere around us. No quiet, no calm. The last time I visited my friend Kiran in Northern Ireland, her youngest daughter was 6, and Phoebe wanted me to help give her a bath. And she washed her long hair, like any six year old does, by basically mushing shampoo all around, then I helped her rinse it, then she took a comb and started just yanking at her hair. I kept offering to help – She knew I liked to brush little kids’ hair and braid it; I’d done that earlier in the week with her hair. But, like any six year old does, she wanted to do it by herself. Stick the comb in willy-nilly, and yank as hard as she could. Not very effective, and it looked so painful, and I knew if she would just let me, I could help her, and it was really really frustrating me and hurting me to see her ineptly and stubbornly yank yank yank. I actually had to step out of the bathroom to take a deep breath and remember, the only way she can learn is to do it herself, no matter how worried I was she was going to yank herself bald-headed. I had to stand by and let her do it. Jesus looks out over Jerusalem, and cries – Cries real human tears – For what is coming, for how inadequate he feels himself to face what’s coming; for how he knows his beloved friends won’t understand it; for how they will feel abandoned and lost and angry. And he won’t be there in a way they will be able to see, unless and until they know how to see. We’re on the cusp of Holy Week. Many a pastor will lament at how most folk jump from the joy and hopes of Palm Sunday to the joy and hopes of Easter Sunday, not realizing all the pain that happens in between. You know what? Chances are you have lived a holy week or two in your life yourself. Maybe you are in the very midst of your own personal Holy Week. When we are in those places – When we turn to Jesus’ tears, and passion, and isolation, and fear and pain of the week to come, the only way we can get through this is to remember: Easter is coming. Life is hard, but Easter is coming. Blogger John Pavolovich wrote, “Every single human being you pass by today is fighting to find peace and push back fear; to get through their daily tasks without breaking down, in the front of the apples at the grocery store, or in the carpool lines, or at the post office. Wounded, exhausted, pain-ravaged people are everywhere, every day, stumbling all around us.” And some days, we are those people, bursting into tears at a red light, drowning in a sea of sorrow until the car behind us honks us out of our stupor of pain. The disciples and followers of Jesus are so so happy – They can see the victory on the horizon – The military, governmental, political victory – The overthrow of the Roman Government, the establishment of Jesus as King, ruling a country where nothing will go wrong. Jesus is so so sad – he can see that they don’t see it clearly, and if they don’t see it clearly when he is RIGHT IN FRONT OF THEM, how, o how will they get through what’s to come. So today, we baptize Max, and no one knows what’s to come , exactly, in his little life – But we know there will be pain, and sorrow, and suffering, because he is covered in human skin and has a human heart beating that some day will be broken. And we know that his family knows this about life, for all they have gone through already, and they will long to protect him from it, and they will be in tears over how inadequate their teachings and their love, and they will watch and support and love and be with him, in all that is to come. Because that is what Jesus does for us: Knows there are some things we can’t just read about in a book, not even if that book is the Bible. There are some things in life we can only live, supported and comforted and held by the words and message and good news of the Bible, that tells us Jesus supports us, and loves us, and knows just how hard this human life, and just how fragile, and just how beautiful. And so we walk together, in joy and in sorrow, holding each other up, trusting the God who holds us all close, as we enter this week holiest of weeks, until we end next week with the promise that there is always, always, always resurrection, in Christ. 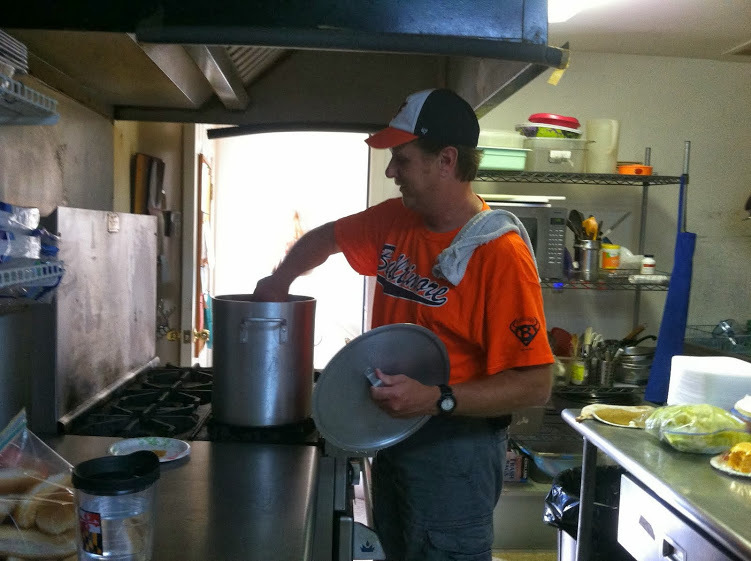 Nine times a year, members of the congregation prepare and serve meals to anyone coming to the door at Elizabeth House, near downtown Laurel. 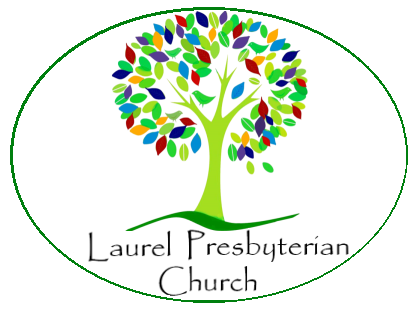 Our members enter and run in the 5K Turkey Trot, held every Thanksgiving morning to benefit the Laurel Advocacy and Referral Service. 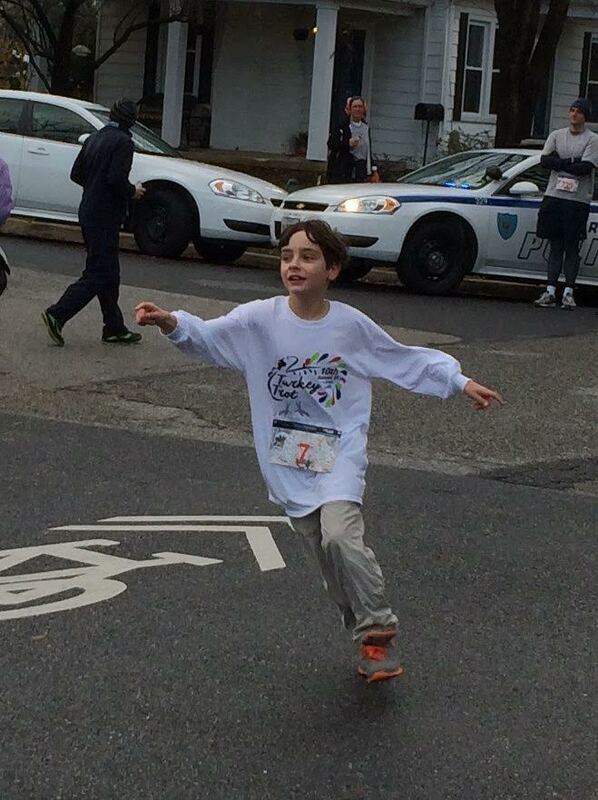 Here,8-year-old Jamie Albertine makes the final turn. 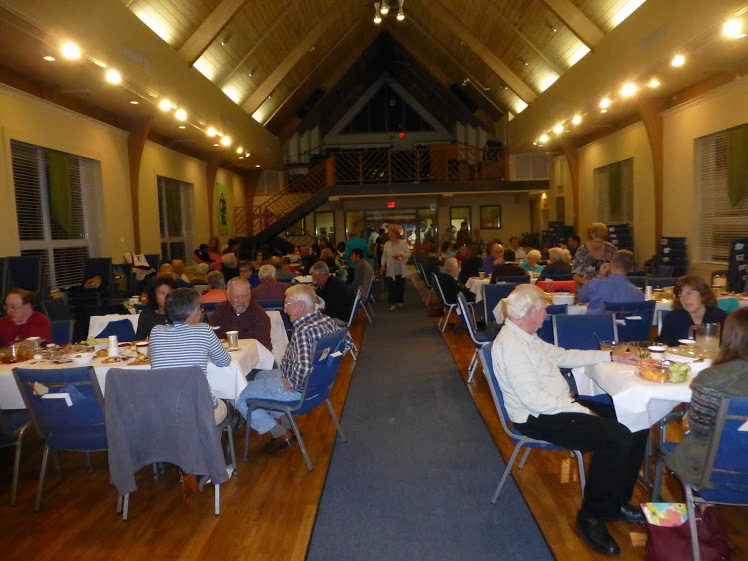 We clear out the Sanctuary and put up tables for our long-running Thanksgiving Dinner, held the weekend before the holiday. Makayla Lyko is baptized, supported by family members. 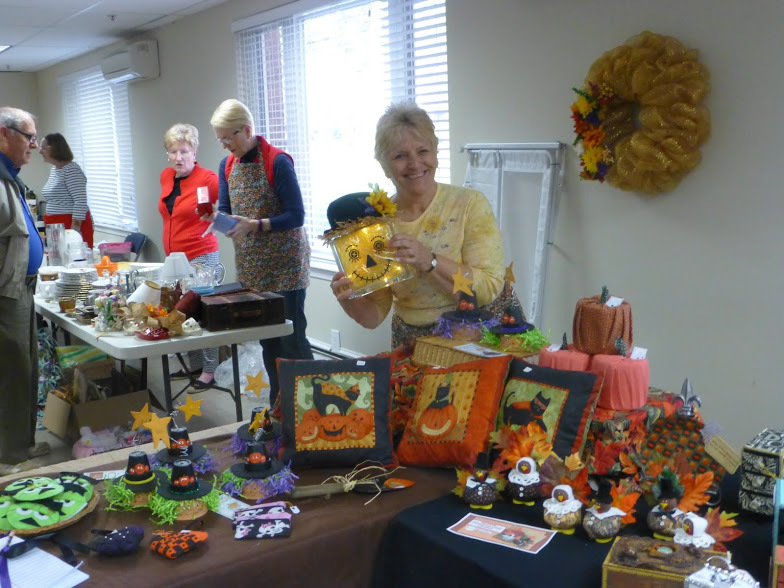 Our 34th annual Fall Bazaar was held on October 28. 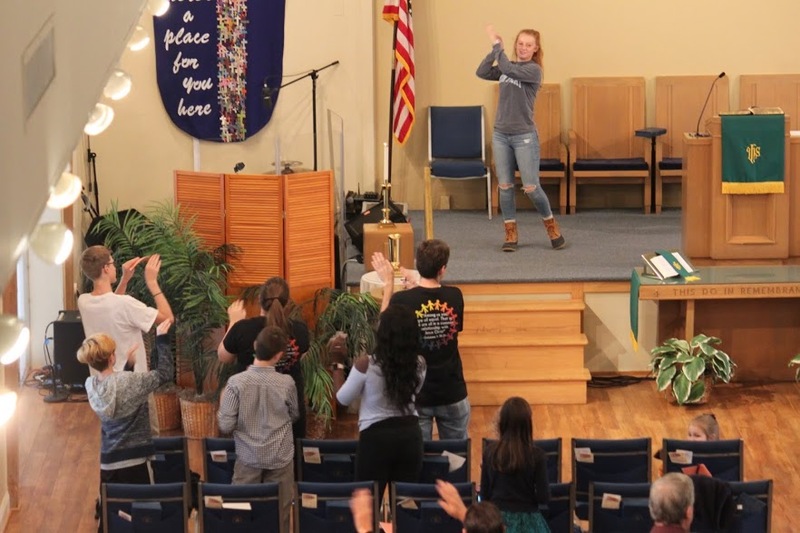 Clara Janush leads the congregation in "energizers" on Youth Sunday, November 5.